The most famous shoe never seen when shod (cause the length of the gown) and even when not shod. 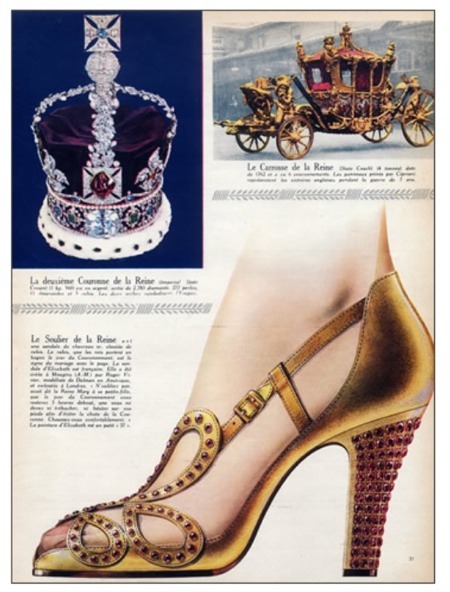 No pictures are in existence of the Vivier's coronation shoe nor the original artifacts since they are not part of "The Queen's Coronation 1953" (Buckingham Palace, 27 July-29 September 2013). There's only this ad below and the 2012's replica. 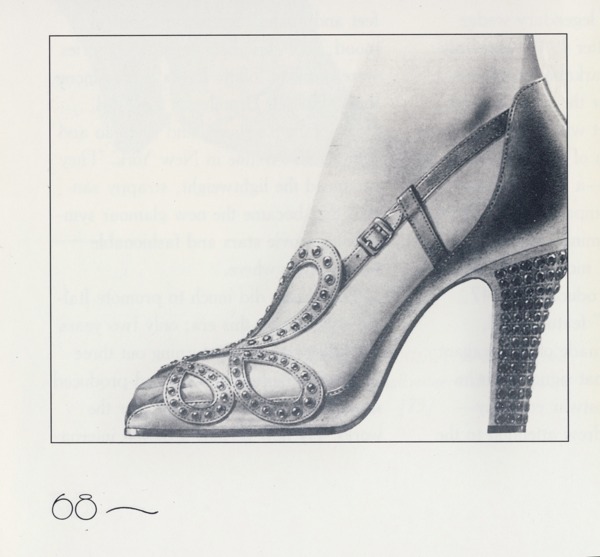 "… design by Roger Vivier of the coronation shoes for Elisabeth II, 1953, created in association with English manufacturers Rayne. 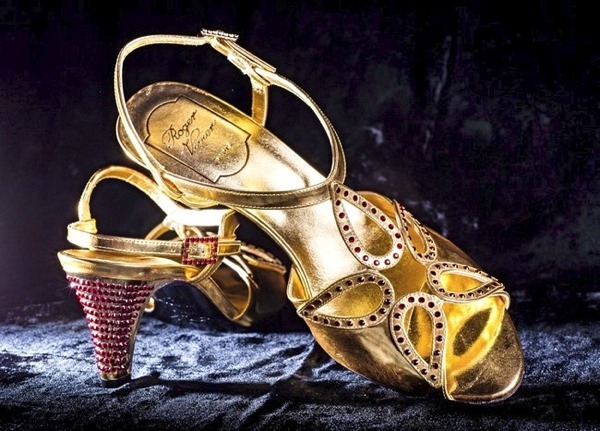 The gold kidskin sandal had a slight platform for comfort (since the Queen remained standing during the three-hour ceremony) and a heel studded with garnets. Pen and pencil on paper. On the other hand, the collaboration with H.R. Rayne can't be found anywhere else, not even on Rayne's official web site where their role as Royal Family's supplier is prominently featured. Bally has created an exclusive exhibition in Australia and Singapore to commemorate the 2012 Diamond Jubilee of Her Majesty Queen Elizabeth II, showcasing two replica pairs of shoes worn by the Queen at her wedding and coronation. Selected from the Bally Shoe Museum’s treasures, these replicas of the shoes worn by HM Queen Elizabeth II for her 1947 wedding to His Royal Highness Prince Philip, The Duke of Edinburgh, and her 1953 Royal Coronation will be on display for the first time in Australia and Singapore in selected Bally stores during August. 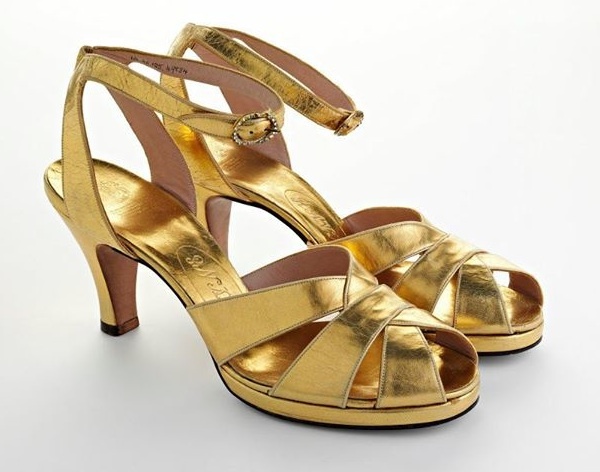 The Queen’s wedding shoes, crafted from duchesse satin, and her Royal Coronation shoes, created with gold kidskin, will be on display exclusively at the Bally Queen Victoria Building Boutique in Sydney, from August 1-8, 2012. Replica of the shoes worn by HM Queen Elizabeth II for her 1953 Royal Coronation, displayed for the first time in Australia at Bally Queen Victoria Building Boutique in Sydney — at Queen Victoria Building. Now: how silly is that? Two brands - like two mothers - claiming motherhood. Wasn't supposed to be the mother always certain? Actually Bally doesn't say they made the coronation shoe but only the replica. It doesn't change much and we're left with the moral that marketing reigns supreme and makes a mock of footwear history along the way.